The news that Blue-Dog Democrat Gabrielle Giffords was shot in the head by a deeply disturbed young man was certainly enough to shock. Add to that the death of a Republican-appointed chief judge. Further add the heart-rending death of a nine-year-old girl who was born on September 11th, 2001. Four others died along with those two. 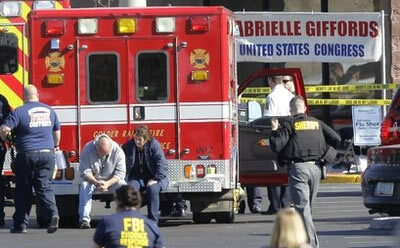 Eleven others were wounded along with Rep. Giffords. The young man who killed and wounded them is all-but certainly a schizophrenic. He's of the age when male schizophrenics first undergo a break from reality. In Jared Lee Loughner's case, his break was both psychotic and violent. There were warning signs of his affliction, found both in the comments of his friends about him and his own writings. When seen in this light, the most dangerous book he read was not Mein Kampf or the Communist Manifesto but One Flew Over The Cuckoo's Nest. Kesey's novel is a great one, speaking of the dark side of the therapeutic state, but it's a sad fact that a mentally disturbed young man can walk away from it believing that any attempts to help him are "the Combine" trying to crush him. In the hands of such an individual, Cuckoos's Nest may even inflame a (possibly latent) paranoiac streak. Which does not detract from the greatness of the novel. Given Loughner's mental state, the shooting is best described as a tragedy. Schizophrenia, particularly a case of Loughner's severity, is an organic brain disease. Its roots are neurological and neurochemical. It's true that certain stressors can influence a psychotic break, but those causes are little more than proximate. Blaming the stressors –I don't know what they were either – is like blaming a driver of a car with stripped brakes for not hitting the pedal quickly enough. Or, blaming the other driver for "driving in a weird way" or some such. Clearly, the real cause of any accident is the stripped brakes. So it is with a serious case of schizophrenia. Demanding that Cuckoos' Nest be subject to "book control" as a result of Loughner's killing spree would be very bizarre. Given his mental illness, you would think there'd be an outpouring of grief for his victims and some sympathy for his mother. His obsession with logic may have been encouraged by his mom in the hopes that he would use logic to control his delusions. As for he, it's quite likely he'll be found not guilty by reason of insanity. He'll be institutionalized, and medicated, for the rest of his life. Since someone with a serious mental illness cannot be reasonably seen as a moral agent, the best way to categorize the bloodshed is tragedy. Had the fates been less cruel, Loughner's psychotic break would not have been accompanied by violence. Admittedly, the therapeutic state is not without problems of overreach. The existence of "medicalized politics," however, does not detract from the major advances we've made in understanding and taking account of mental illness. This enlightenment is a major plank of civility. Gone are the days when a schizophrenic would be shot like a mad dog when agitated. Long gone are the days when an organic brain disorder was blamed on witchcraft, or the shady people on the other side of town, or people that aren't quite like us, or the Devil. At least one would think so. But not in today's America. Granted that the shooting of a federal Representative is disturbing in the ordinary sense. It's not unreasonable to see panic in such a circumstance, along with wild tales right afterwards that satisfy the demand for an immediate answer. But it's also reasonable to expect those wild tales to dissipate when the facts come out. The hysterical blaming of the Tea Party, and Sarah Palin, has gone beyond mere panic. It's now plain mob hysteria. The fact is, Tea Party rhetoric is about as 'hateful' as left-liberal rhetoric was during the Bush Administration. Lots of documentation of this balance has been compiled at the Free Republic. Fact is, political rhetoric on both sides has been heated. Common-sensically, the Tea Party's heatedness has mirrored the Left's earlier heatedness. The level of the former is merely a gauge of the heat in the political kitchen. It's one thing to angrily bash the other side. It's another thing entirely to descend into hysterical false accusations, many of which are tantamount to blaming an organic brain disorder on people who dish out what they've taken. The nuttiness coming from liberals has gotten to the point where I wouldn't be surprised to read of one claiming that George W. Bush was Laughner's accomplice! When the dust settles, the liberals will have to face the fact that their very public mob hysteria will be a permanent part of the Internet. Their treatment of the Tea Party and Sarah Palin is a plain indication of how much buried hatred there is in the so-called progressive camp. Had the Tea Partiers reciprocated fully, it would have made for quite the "United States of Hate." But they haven't. It's true that Freepers are prone to being opinionated, are implacably opposed to the gay agenda, tend to dismiss non-conservative Republicans as "Republicans In Name Only," and are at times hot-headed. But, their purported "hatred" is governed by a respect for facts and – I dare say it – caritas. Anyone going to a thread on the death of a political opponent and expecting a dance-on-the-grave hate fest will probably be disappointed. It's more characteristic to offer condolences and prayers. Moreover, there are lines that Freepers generally don't cross. It's true that there is a contingent of birthers there; it's also true that more than a few are fond of comparing Obama's governing to that of Hitler. It's true that some insist that Obama is a secret Muslim. But the line observed confines such heat to policy criticism, Obama-bashing and generalities. No conservative of any prominence specifically blamed Obama for Major Hasan's killing spree in the way that some liberals have been very publicly blaming Sarah Palin. That line, the typical Freeper doesn't cross. Nor should anyone. The hatred exhibited by some so-called progressives is quite clearly the result of political monomania. Only political monomania can explain why more than a few 21st century Americans, when confronted by a disturbing tragedy whose cause is clinical insanity, are acting like ignorant peasants. Ye who loveth the maligned, belongeth with the Tea Party. Daniel M. Ryan is currently watching the gold market. He can be reached at danielmryan@primus.ca.